the sixth conference of parties ( c o p -6) to the un Framework Convention to Climate Change ( unfccc ) is scheduled to be held at The Hague in the Netherlands from November 13 to 24. 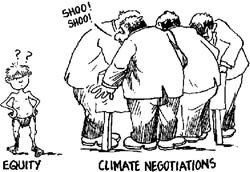 It might turn out to be the most crucial meeting of climate negotiations till now. The deciding factor will be the willingness of governments to work together for a solution to global warming. Meanwhile, the Intergovernmental Panel on Climate Change, unfccc 's scientific body, stated in October that the link between human activity and global warming is stronger than ever. Its findings project that the average global temperature over the next century will rise by a significant 1.5-6C. Recognising that industrialised countries were largely responsible for the high concentration of atmospheric greenhouse gases ( ghg s), the 1997 Kyoto Protocol had set legally binding targets for them to reduce their ghg s emissions by an average of five per cent of the 1990 emission levels by 2008-2012. c o p -6 is also crucial because participants will work out the modalities under which the protocol will function. The specifics of the protocol's functioning remain unknown. Industrialised countries have been pushing for cheapest options to meet emission reduction targets. They support certain 'flexibility mechanisms' provided by the protocol. These involve trading of ghg emissions, mainly through energy projects, allowing Northern countries to meet their targets without substantial domestic action. The eu has recently stated that domestic action should be employed for most of the emission cuts. The us , responsible for 24 per cent of the global ghg emissions, refuses to take domestic measure till developing countries also do the same. Should there be a cap on such projects? This key issue will be decided at c o p -6. With economic interests of the North dominating, it is imperative that governments from the South insist that negotiations are about their citizens' rights to the Earth's atmosphere. They have to ensure that the official agenda includes working out a system of 'equitable entitlements' to the atmosphere on a per capita basis. If developing countries are to participate in emission trading projects of any sort, they have to first figure out what they are trading and, subsequently, how much of it.